The bulk of the population had only just gained enough confidence to return to the city after it’s most devastating plague outbreak, when it was hit by the infamous fire. 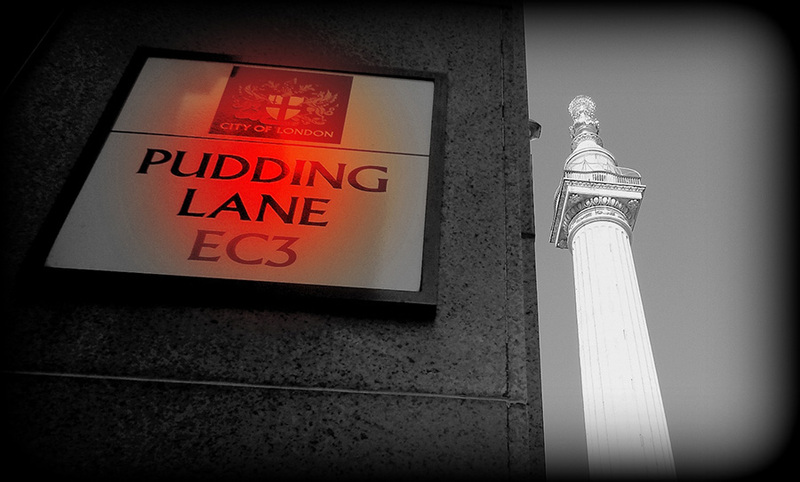 In London’s plague ridden history the epidemic of 1665 is remembered above all others. It started in April and ravaged through to the following winter. Thousands joined the exodus out of the city, one in three of the brave citizens that stayed subsequently perished . In just one week in September 1665 the official death toll was more than 8,000, although the true figure may have been up to 50% higher according to 17th century diarist John Evelyn. Christopher Wren fled to the relative safety of Paris. The architectural inspiration he would gain from his visit would be put to constructive use sooner than he could ever have imagined. Barely twelve months later, during the early hours of Sunday 2nd September 1666 a fire broke out in Thomas Farynor’s bakery in Pudding Lane. It may have seemed to locals to have been just another city fire, after all, fire was no stranger to a city made predominantly of wood. Many dwellings were so crammed together in medieval lanes and passageways, that it was possible in some areas to leap from a jettied top floor window into the window of the building opposite. Indeed, this was the route taken by Farynor and his household to escape the flames, all except their maid, who gripped by fear, refused to jump and became the fire’s first victim. 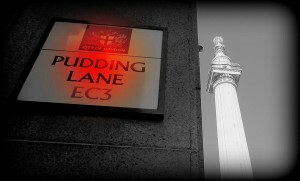 Pudding lane is situated in the south-east of the city, with a strong easterly wind the embryonic fire was soon a fast spreading inferno heading for the heart of the old city. The warehouses lining the riverside on nearby Thames Street were full of combustible materials such as oil, tar, and yet more timber. Soon they were ablaze, and in a city left vulnerable to fire after a hot and dry summer, frantic efforts at containment became futile. The conflagration raged across the city for four days and nights consuming everything in it’s path, only when the fire had finally been quelled, due greatly to a change in wind direction, could the magnitude of the disaster be fully comprehended. Medieval London was gone….Over 80% of the walled city reduced to ash…… 100,000 people made homeless…13,200 houses, 87 churches, 44 company halls, St. Pauls Cathedral and numerous other secular and religious buildings either totally destroyed or in need of rebuilding.